Also called Pepin of Landen. You can also spell him Pippin. King Chlotar died in 629 and Pepin lost his job because the new king, Dagobert I wanted to rule himself. 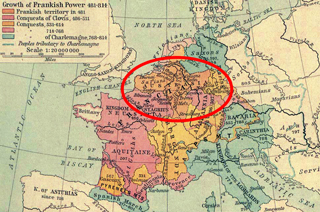 When Dagobert died in 639, Pepin was back in the saddle, but shortly after he died too. Pepin's son Grimoald succeeded him as mayor of Aurasia, which in effect meant ruler. Pepin was the mafia-godfather-type who valued a powerful family. But first he had to have a family. So, together with his associate Arnulf, who was the bishop of Metz, Pepin started the Carolingian Dynasty by arranging the marriage between his daughter, Begga, and Arnold's son, Ansegisel. And what a family of power that came to be.